Patio, deck, porch…no matter what type of outdoor space you have, summer is the time to embrace your outdoor spaces and enjoy those longer days and warmer temperatures. But, that doesn’t mean you have to sacrifice all the comforts and beauty of your indoor spaces. Outdoor spaces are perfect for relaxing, entertaining and spending time with loved ones. In fact, you may end up loving your outdoor space even more than your indoor one. Even a rustic picnic table looks special with real dishes and cloth napkins. 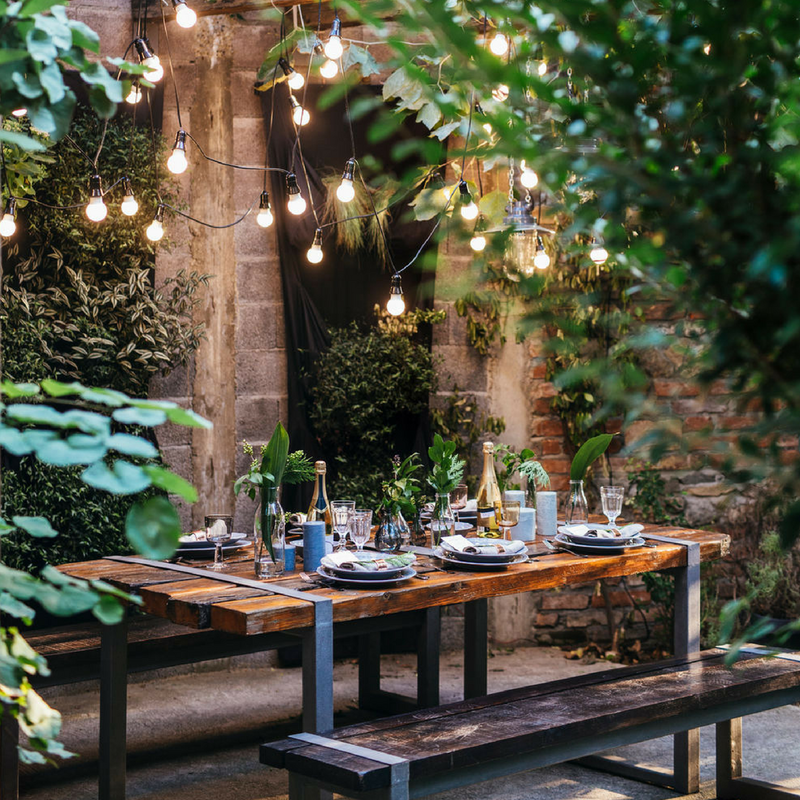 When you’re entertaining in your outdoor space, make it extra special by setting the table just as you would indoors. Organic décor like fresh flowers and greens from your garden complete the look. Don’t underestimate the value of a string of lights. They look great in a shaded area during the day and provide the perfect amount of magical light for a relaxing evening or festive dinner party. Building a trellis over all or part of your outdoor space provides the perfect structure for climbing plants and hanging lights. The options to provide shade, light and beauty are endless. Choose outdoor furnishings that mimic your favorite indoor style. There are many options available from sleek modern designs to more traditional styles. Keeping the same style as your interior will help your outdoor space feel like an extension of your home. Just like in your indoor spaces, an area rug can help complete the look of your outdoor space. Are rugs provide a soft place to put your bare feet, but they also help pull a space together. Bring in pops of your favorite colors and make your space more comfortable with cushions and pillows. Today’s water-proof and fade-resistant fabrics make outdoor living beautiful and worry-free. If you have a roof over part of your outdoor space, a built in ceiling fan is a perfect way to keep air moving, but if you don’t, tabletop fans work great too. Not only do fans keep you cooler, they also keep pesky bugs away. Accessorizing your space adds personality and character. Bring in some beautiful vases, candles, floral arrangements and other accessories that match your style. Just remember to make sure fragile accessories are protected from the elements and won’t blow away with a strong breeze. For extra peace-of-mind, try securing accessories to your furnishings with removable adhesives. Adding shades to your porch allow you to control the amount of sun your spaces gets which means you can better control the temperature. If shade aren’t an option for your space, make sure you have some beautiful umbrellas on hand to provide shade on hot summer days. The content of this post first appeared in Carpet One Floor & Home's 2018 Summer Issue of Beautiful Design Made Simple.